Chia seeds are packed with fiber which is important for bowel regularity and healthy stool. The high fiber content also helps you feel full more quickly as it absorbs a considerable amount of water and immediately expands in the stomach (remember to drink extra water). The fiber also slows digesting which makes you feel satisfied for longer. Chia seeds are also a good source of protein which is important for balancing blood sugar levels. It’s high in zinc and studies have shown that zinc helps your body to increase leptin which is the hormone signalling when we’ve had enough to eat. So lots of benefits here for healthy weight loss. At the same time the fiber in chia seeds work as a prebiotic which is food for our good gut bacteria (probiotics). Keeping our gut healthy by feeding our probiotics also promotes overall health. They are among nature’s richest antioxidants which can help prevent premature skin ageing due to damage from free radicals. Chia seeds also have anti-inflammatory properties, regulate cholesterol and lower blood pressure which makes them very beneficial to our heart health. This is due to the high content of omega-3 fatty acids which also help absorb the fat soluble vitamins A, D, E and K.
Chia seeds have a high calcium content which is essential for strong bones and healthy teeth. Mix the chia seeds with the nut milk, coconut cream and coconut sugar/stevia and cool in the fridge for at least 4 hours or over night. I did it over night and finished it off in the morning for a wonderful breakfast. Depending on how ‘solid’ you like your pudding you may want to experiment with the quantity of the milk. Sprinkle some desiccated coconut and pumpkin seeds on top and finish off with some fresh berries (I used a lot more than what you can see in the picture :-)). Add all ingredients to your shopping list and set yourself a reminder on your phone to prepare this the night before so you can enjoy it for breakfast. 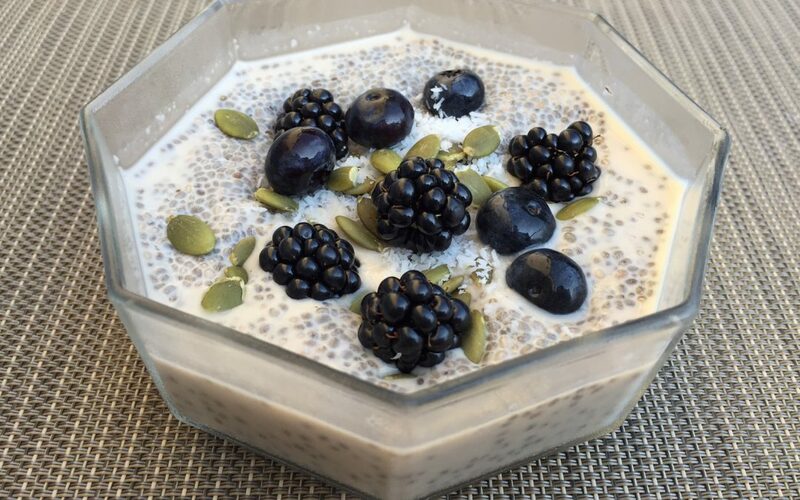 If you want your chia pudding to solidify faster you can use 3 tbs of chia seeds in 125ml of hot nut milk. This will firm up your pudding in 20 to 30 minutes, you can eat it warm or let it cool. Sign up to join our community where we take the journey to more energy, better health and feeling amazing one step at a time.